I have black crickets everywhere and they’re pretty good sized. What are they and what do I do? These are FIELD CRICKETS. Typically they’ll live around the home, up under house siding, under mulch or pine straw and in flower beds. Once established in these areas, some can start migrating inside. The good news is they’re fairly easy to control. So for the outside, you’ll need to bait the flower beds and any mulch or pine straw with Maxforce Granules. This bait will last 1-2 months and black crickets love the stuff. They’ll readily eat your offering and die. Next you’ll want to spray the siding on the home with Conquer. 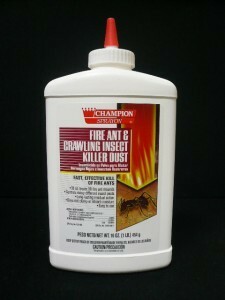 This odorless concentrate is mixed with water and should be sprayed on your siding and foundation wall, being sure to focus your application where black crickets are likely to enter. This will be around doorways, windows and garages. For inside the home, you’ll need to treat around the points of entry as well as any cracks or crevices where you think some might be nesting. Conquer can be used inside and is cost effective for treating large areas. But if you have a lot of hard woods or tiled flooring, PT-Phantom might be better suited. It’s an odorless aerosol that goes on dry and ideally suited for hard surfaced flooring. Lastly, if you have any crawl spaces close to where you’re seeing activity, they could very well be harboring nests. These areas typically hold a lot of moisture and though you can spray them with Conquer, dusting them with Deltamethrin Dust will provide a lot more effective. Deltamethrin Dust will last 6-12 months and does well in moist areas.